a couple of times a year, a fabulous thing called "restaurant week" happens in los angeles (as well as quite a few other locations nationwide). i've never been able to take advantage of the fantastic fixed-price 3-course lunches and dinners offered by a wide variety of great restaurants...until this year. 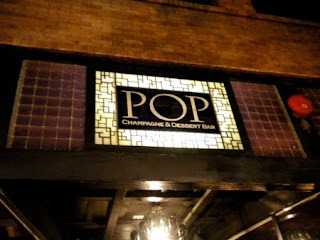 i'd heard about pop champagne & dessert bar in pasadena before, but never really had a good reason to go. 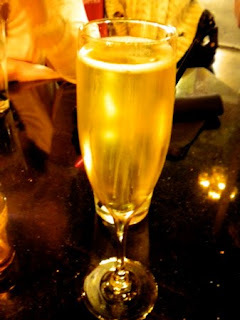 after all, i'm not really into champagne or wine, so there were other places that were a little higher on my totem pole of restaurants to visit. as i perused the long list of participating eateries, and saw that it was included, i thought of my two local SFAMily members, amber and lilcee. i dropped them a quick e-mail to see if they were interested in checking it out. i wasn't surprised to learn that lilcee had already been and had had a relatively favorable experience, but amber, like me, had not yet tried it out. so after a few more e-mails, we settled on a date and made a reservation. of course, i hit a little bit of traffic and ended up the last to arrive, but that was okay. i plopped into a chair at the table, where amber and lilcee were already chatting and getting caught up. 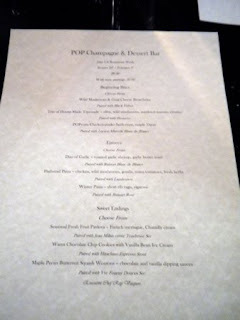 i'd already looked at the menu online, but i still checked it out just to make sure i hadn't overlooked anything good. we ended up ordering one of each appetizer and dessert and all chose the same entree. and then when amber asked to have a glass of the wine paired with just the first course, the server was completely confused and told her that she could only have pairings with all three courses, or none at all. we all looked at each other with that lost-puppy dog look and said "so...you don't serve wine by the glass?" duh. the server slunk away and came back a few minutes later with her glass (which, she was happy to note, was delicious). first course: popcorn chicken for amber (a little dry, but full of flavor and served with a really tasty sauce), trio of tapenades for me (sun-dried tomato, wild mushroom, and olive - so good i kept it at my side all the way through till the end of the second course), and wild mushroom flatbread pizza for lilcee. 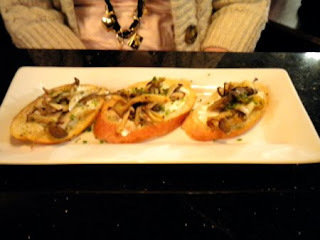 second course: duo of garlic. 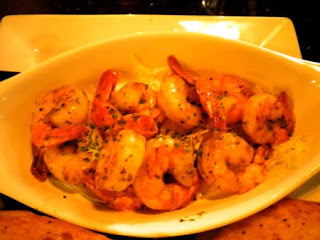 roasted garlic shrimp, served with garlic butter toast. it was quite a generous portion, and scrumptious. i ate every bite. 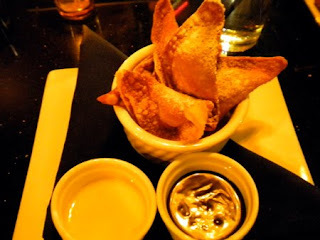 for dessert, i branched out a little and went with the slightly odd-sounding maple pecan butternut squash wontons, served with chocolate and vanilla dipping sauces. 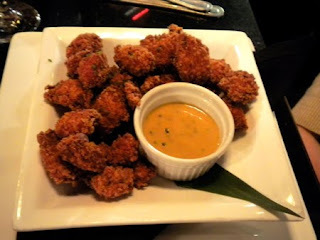 they were actually pretty tasty, and i'm considering trying out a version of it at home. although i kind of think i'd be the only one to eat them. heh. 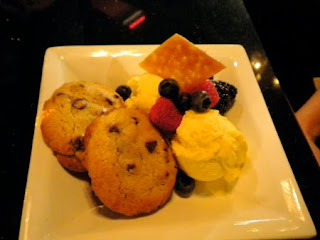 amber chose the "cookies and cream," homemade chocolate chip cookies served with vanilla bean ice cream. 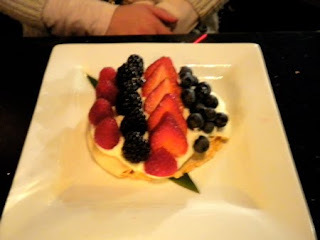 and for lilcee, the fresh fruit pavlova - a meringue topped with chantilly cream and lots of pretty, colorful fruit. despite the spotty, super slow service (which lilcee had warned us of early on), we had a great time together as we always do. and before we left, we got a server to take a quick group photo. not too bad for my first stab at dine l.a. and there are two more reservations in the coming week. 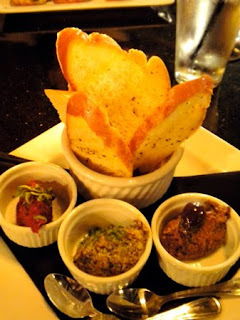 yay for prix-fixe dining! 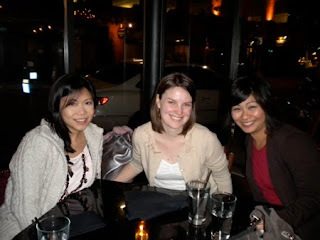 Fun night with fun girlies! Hmmmm the dessert all look so good. Yum. The entrees look fabulous as well. I guess I shouldn't have looked at your blog just before dinner.